One of our readers sent us a link to an article about a “restoration” project gone awry in his neighborhood. Mount Baldhead is a city-owned park in Saugatuck, Michigan. US Fish & Wildlife funded a $700,000 federal grant to eradicate non-native plants on Mount Baldhead and several other municipal parks in the area. The grant was used to hire “certified applicators” to spray the non-native plants with imazapyr. Mount Baldhead was sprayed in summer 2010 and again in fall 2011. In spring 2012, the native oaks and maples, under which the non-native plants had grown and were sprayed, began to show signs of damage. Now a significant portion of the native forest is leafless and barren. 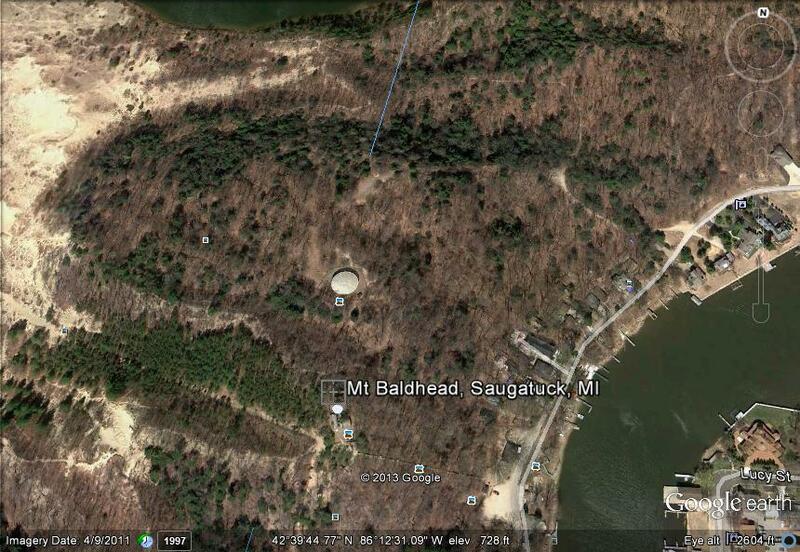 Mount Baldhead, Saugatuck, Michigan. A clearer view of the damage is available in the article to which we provide a link above. We were denied permission to publish that picture. The soil on Mount Baldhead is being studied to determine how far the pesticide has seeped into areas where it was not sprayed. This information may predict the extent of the eventual damage to the native forest. The ultimate fate of the trees that have been damaged is not known. There is no antidote to the pesticide. Will the trees survive? We don’t know yet. What does it mean to be a “certified applicator” of pesticides? This story is of interest to us because imazapyr is being widely used in the San Francisco Bay Area and its use has increased substantially in the past year. Because imazapyr is being used heavily, we have read the manufacturer’s label for the formulated products (Habitat and Polaris) and the federally mandated Material Safety Data Sheet. Therefore, we know that imazapyr should not be sprayed under trees you do not want to kill. This is a product that is mobile in the soil. It is capable of traveling from the roots of the plant on which it is sprayed into the roots of adjacent plants on which it has not been sprayed, killing or damaging plants that were not the intended targets of the spraying. In December 2011, we witnessed imazapyr being used in San Francisco’s public parks for the first time. It was being sprayed on cape ivy under native willow trees. We doubt that the willows were the intended targets of the spraying since they are native. We wonder if the willows will survive in the long run. These incidents make us ask what, if anything, it means to be a “certified applicator” of pesticides. Does the certification require the applicator to read the manufacturer’s label? If so, does the certification require the applicator to actually follow the directions on the manufacturer’s label? Clearly, this isn’t happening and there don’t seem to be any consequences for the “certified applicator” who kills plants and trees that he/she wasn’t hired to destroy. So, we conclude that such certification is meaningless. • Increasing use of toxic pesticides is required to kill non-native vegetation. These pesticides are inherently hazardous and their incompetent use makes them even more hazardous. • The wildlife that lives in our open spaces is being poisoned by these pesticides and they are losing their homes and their sources of food. • The results of these projects do not justify these dangerous practices. The projects often look more dead than alive. It will certainly live up to its name Mount Baldhead now. $700,000 grant to spray weeds? Outrageous! Even if a less toxic herbicide were used what is to keep the non-native plants from coming back from the surrounding area as I am sure that they are well established elsewhere in Saugatuck. Now there is a loss of tree cover and all the ecological “services” these provide and plenty of new open ground for the non-native plants to colonize. But that will mean more spraying in the near future and so job security for the certified herbicide applicators. It will also mean “restoration” efforts as erosion control measures will need to be implemented and new trees will need to be planted. This happens more often then you know. Some of the applicators have told me horror stories. But lets not forget it’s the land conservancy and they are all about protecting the environment! Imagine applying herbicides in areas where plants are not in neat rows. Its bound to fall short of the desired results not to mention the physiological effects on the applicators. Now they want to do this to the Great Lakes. Hey they have a billion dollars to burn. You can keep a lot of ecologists employed with that kind of money. Alas, we’ve lost our way.